While Adele's dedicated fandom to Beyoncé has long been well-documented, the British singer truly was all of us personified when it comes to watching the Queen perform via livestream from the comfort of our own homes and WiFi connections. Saturday night (April 14) Beyoncé delivered an unforgettable two-hour performance that many are saying showcases how she's in her prime, two decades deep into her career, no less. During the performance, Adele took to Instagram to share a trio of "moods," with each video clip perfectly summing up how countless #BeyHive members were feeling while experiencing the singer make history as the first Black woman to headline Coachella. The video tribute features the singer wearing pajamas in her living room, flailing about with a trumpet in hand, passionately imitating the moves of Bey's background dancers and unapologetic headbanging. Judging from #BeyHive Twitter, these clips accurately depict what thousands and thousands of living rooms must have looked like across the country this weekend. 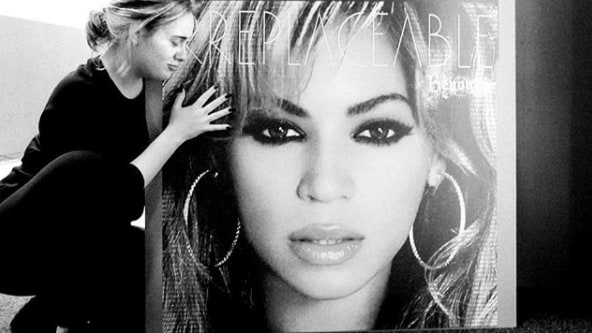 Adele previously has referred to Beyoncé as "the artist of my life," expressing how Bey's Lemonade album should have earned Album of the Year over her own during a much-discussed, tearful acceptance speech at the 2017 Grammy's. Take a look at REVOLT's in-depth recap of Beyoncé's Coachella performance and keep it locked for more updates regarding the annual festival. Those at home can catch the official Coachella livestream, here.